The Indoor / Outdoor 3 MP Motorized PTZ Dome Network Camera with varifocal lens, model TV-IP420P, provides PTZ and powerful 3 MP resolution in low-light environments. This ultra-compact camera delivers year round surveillance with an IP66 weather rated housing to withstand extreme environments. 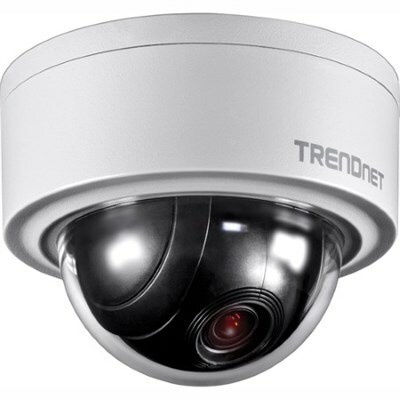 Use the included pro-grade software to manage up to 32 TRENDnet cameras. Free iOS and Android mobile apps support remote live viewing and view up to 350 degrees with the motorized pan tilt feature. Motorized PTZ: Motorized 350-degree pan and 90-degree tilt, with user defined 3D zoom within the web interface. Power over Ethernet (PoE): PoE offers cost savings and the flexibility to install this compact dome camera in the desired location. Outdoor Ready: Built for extreme environments with an IP66 weather rating and an operating temperature range of -30 - 60 degrees C (-22 - 140 degrees F).